This cool weather will not stay much longer I hope! Cool weather yes but it is still March. The weather will change soon. don’t despair the Summer is just a short few mounts away. 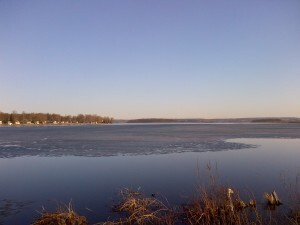 Before then is the Rice Lake Fishing Festival, check out the great packages http://bit.ly/GWOcHp . Even though it got a little cooler it has only slowed the mosquitoes down a little they are still out there. I noticed more pan fish in close to shore this morning, I guess they are looking for that perfect place to set up house! The weather is still fantastic for this time of year, so we will take full advantage of it. 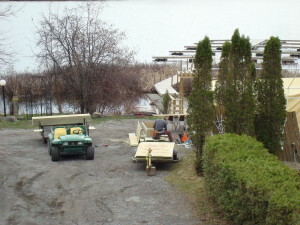 First, get the repairs on docks done while the other areas dry out then, when it dries up, we can get started on grounds cleanup and flower bed maintenance. The transformation begins before the rain. The grass is more than green it’s growing. 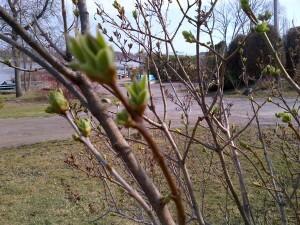 Lilac bushes, popular, and willow trees are in full bud. Turtles are sunning on logs in the marsh areas, the peepers are singing every night. The birds are building nests and searching for mates. The pan fish are starting to gather in the shallow areas where the water is warmer. All this is happening before the first of April. 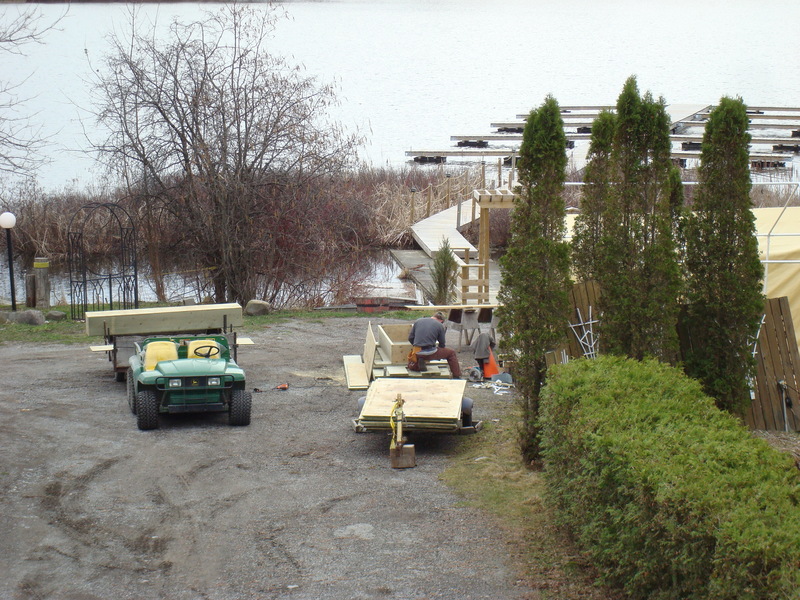 Not to be up-staged we are getting a jump on preparing the Resort for the arrival of our first guests. 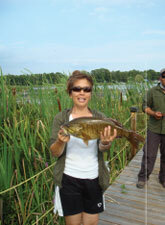 Spring pan fishing is likely to start early this year so start planing your spring fishing trip now. We will be ready, will you? The ground is drying up fast and thee grass is starting to grow I hope that Mother Nature doesn’t laugh at us after she dumps a mega load of snow on us in a few weeks. Even if she does I will still relish this fantastic weather that we have been blessed to have. Yesterday I left the patio door open to enjoy that warm spring air in but in came some unwanted guests, mosquitoes. Yes I bot bit and this morning I got my revenge, I swatted 2 of them! The Ice is out of the lake, the docks are out. there are some repairs to be done on a couple but they should be done later this week. There are boats in the water and the anglers in the bay. McGregor Bay is warming up really fast and that means the pan fish will be looking for nesting spots. I would think that in the next several days I’ll see schools of Black Crappie coming in close to the docks to spawn. The earliest that I can remember. It’s time to get serious about fishing, don’t forget about the second annual Rice Lake Fishing Festival, May 12 to June 17. Highland View is offering special Accommodation pricing for the festival at Fishing Festival Specials. We have perks Cards for purchase here or you can visit Perks Card and purchase it on line. Gosh I love this time of year. It’s happening all too fast! We are starting our 28th season and this is the earliest that the ice has been out of McGregor Bay. Most of the docks should be in and the barge moored for the coming season. Work is planned for this Saturday. Yesterday there were geese, ducks, seagulls, and 4 beautiful white swans swimming of the ice pan. This morning we had our first spring thunder storm complete with a SE wind and rain. The snow is, for all intent and purpose GONE,(its early it might be back). The grass is showing signs of green and the frost is heaving the roads on the property. The ground is mushy and there is that earthy smell in the air that is spring. 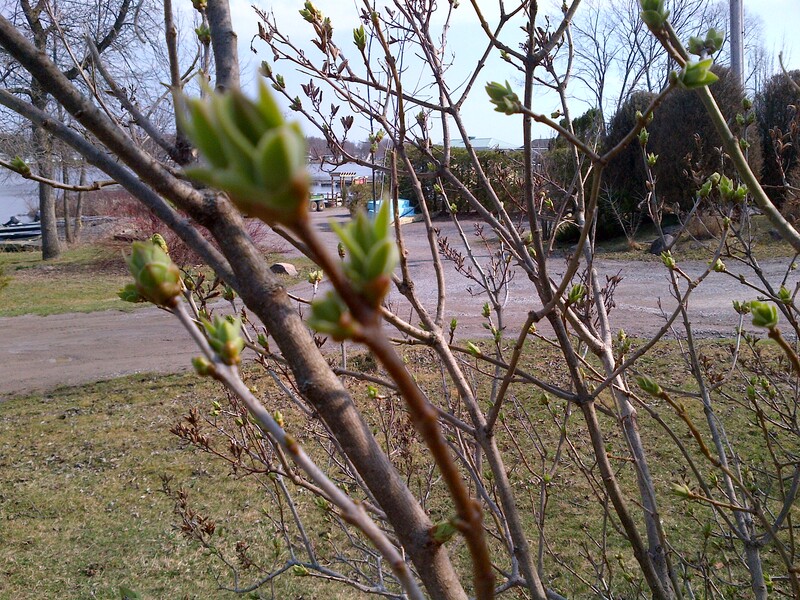 The buds on the trees are swelling and the southern birds are arriving on a daily basis. The other day we had robins and red winged black birds in the tree near the launch ramp, this morning there was about 40 gray jays in the tree near the croquet court. A couple of days ago there were snow birds gleaning the remaining berries off the wild grape vines. Just now a flock of black birds just flew past the den window. The cottages will be next and it depends on how fast the frost is out of the ground. I bet the water will be on 3 weeks earlier than normal. I just keep my fingers crossed that we won’t have a cold snap. If the grounds dry up we should have boats in the water by the 22nd or 23rdMarch. So all you anglers eager to hook into some black crappie or yellow perch give us a call we might be able to realize your dream. Now this is March weather! This morning there was a little sun shining through the tree branches warming up the lone robin and a single red winged blackbird. I don’t think that the robin’s spring song was amusing the blackbird because when the robin started his serenade once again the blackbird took off. Then just before noon, the sun was replaced by big dark snow-bearing clouds which proceeded to dump at least 2 inches 5CM of snow. Then came that notorious March wind to whip all that snow into a frenzy. What a difference from yesterday. Spring likes to tease us just a little, but winter sure doesn’t want to leave without letting us know how cruel he/she can be. Yesterday the goats and donkey were nibbling on the first green tips of tender grass and today they reluctantly headed for the bale of hay! There is hope that the snow will soon be gone because last year it did the same but not as gently as this year. We are just itching to get started because May is just a short month and a bit away. The Resort has weathered well but there is that hectic time of opening and pre-pairing the cottages. Getting boats and of course the gardens and planters ready for our first guests. I love this time of year the most. The sun is returning to her full glory and there is that special smell of spring in the air. Over the last weekend the lows were almost -20C this morning Wednesday March 7 2012 at 06:30 am it was +5C. and there is a report that we may hit up to 12C by the weekend. The area of open water near Prison Island has doubled in size and the ice free area in the channel mid lake has grown as well. Even the ice in front of the barge is gone. I think that the break-up will be earlier then normal this year. The middle of the lake in front of Harris Island is open. March 3, 2012 10:15AM. I have heard the geese and noticed several ducks flying over head. I’ve suspected that there was some open water west of Prison Island near the weed bed but was not able to confirm it till this morning. With the wind last night reaching 100KMH (60MPH) I decided to take an early morning walk around the property to see if there was any wind damage. Glad to report there was none other than a few branches here and there. 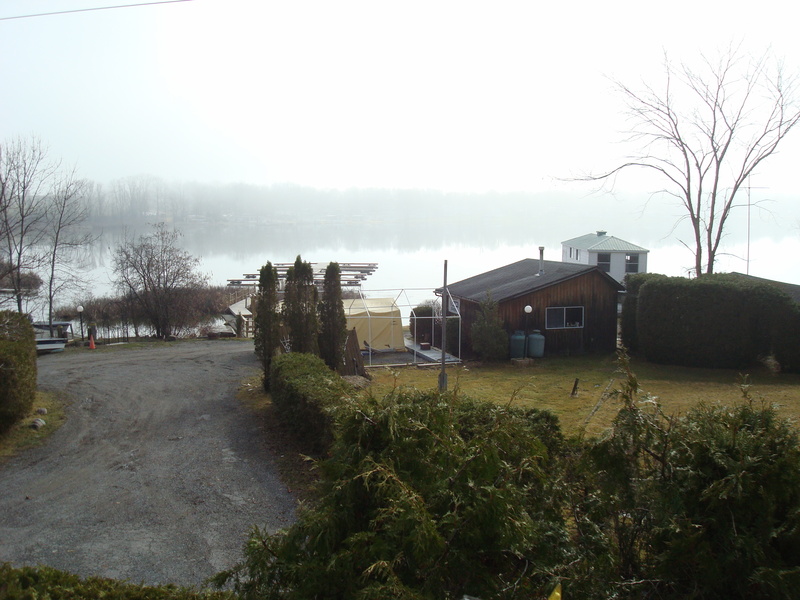 When I was up at Cottage 20 Meadowview I noticed that indeed there was open water where I assumed it would be but the rest of the lake looked solid but it was a little foggy and I really couldn’t see all that well. Just a few minutes ago I was looking out over McGregor Bay and noticed that there was a gray strip just beyond tip of Serpent Mounds and the tip of Harris Island. I thought to myself “this is too early, we are still at least three weeks before break-up, this can’t be what I think I see.” So I grabbed the binoculars and sure enough it was open and the wind was wiping up white cap on it too boot! I don’t think that I am ready for that, actually I don’t know what I think other than disbelief. I have to get the camera out and will post a picture as soon as this snow squall ends.